An absolute superb design has embellished the Shanghai boutique, as a celebration of Hermes' venture into the Far East. 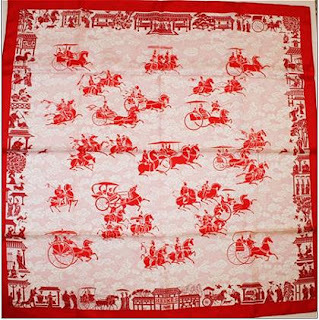 The design cleverly adapts the horse theme to a Chinese tradition, creating "les chevaux du Ciel" ("the heavenly horses"). 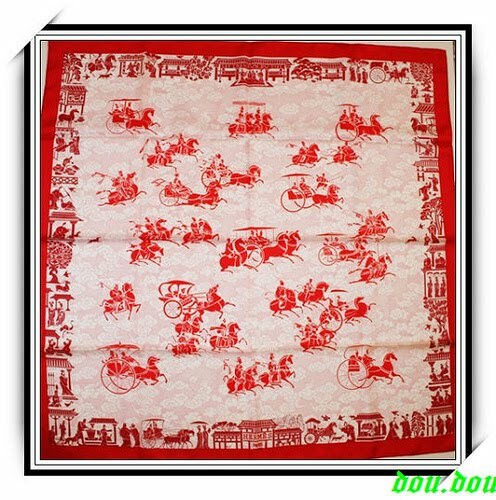 As the scarf is available exclusively in China, it would be by great fortune to see one and assess it appropriately, but it appears that the richness of the background is part of the design, rather than the traditional jacquard pattern. A truly magnificent piece that enchants the eye when displayed both rolled open, and knotted. A night at the National Ballet of Canada reminded me of this truly spectacular design depicting scenes of equestrian ballet - in which the noble grace with which the horses "dance" is both fascinating and mesmerizing. The graphic composition is reminiscent of a drawing on a cartoon created by one of the Italian artists of the Renaissance (the first technique in executing a large-sized painting or fresco is to create a copy of the design on large sheets of paper, called "cartoons", based on which the artists would later transpose the image on the canvas or mural). 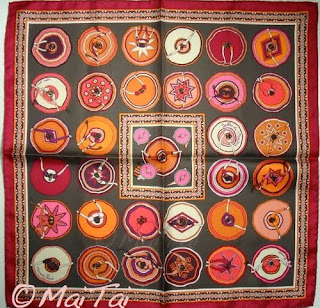 The scarf makes a wonderful knot as well, which would undeniably elicit the admiration of those who take notice and would stir the curiosity and imagination of those who admire it. One of the earlier "drawings" created by Hubert de Watrigant, attests to his unique artistic vision and creativity and further strengthens his place as one of the best illustrators (and painters) of horses. 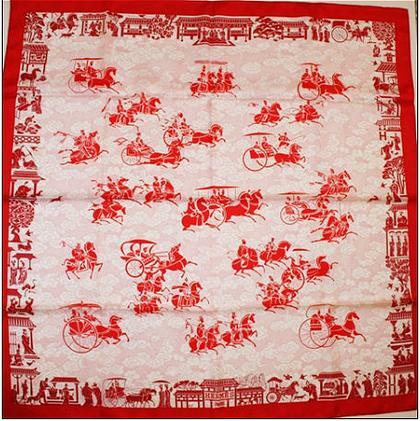 The design of this scarf is the iconic "Brides de gala" ("Gala Bridles"), first released in 1957 and subsequently re-issued numerous times (1967, 1990, 1992, 1993, 1998, 2000, 2004 to name just a few, created on silk, mousseline, cashmere/silk, cotton and in 2009, carre fluid on silk jersey and pleated silk) before yet another reinterpretation - this time, on a different "canvas". This post focuses on the latest reissue of this classic and emblematic design, in 2009, on dip dyed-silk. 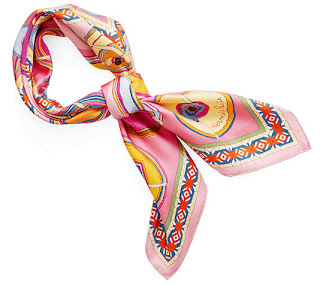 This is a new technique experimented by Hermes (so far, featuring only this design) whereas the scarf is immersed in a dye bath that imprints a colour filter giving it the velvety feel of washed silk (further enhancing the "vintage-style" collection recently launched). The aged, patinated appearance and irregularities in colour are the expression of its charm and unique identity. It is with this description in mind that I dedicate this scarf to a very dear friend of mine who has witnessed me grow and whose zest for life continues to be a kindling and inspiring force behind my desire to live life at its fullest and touch countless people with my spirit. 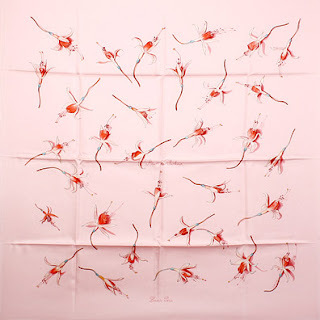 The newest addition to my review is this absolutely fantastic baby pink "Fleurs de fuchsia" scarf, which gives a very lush and very rich sensation to the discriminating eye. 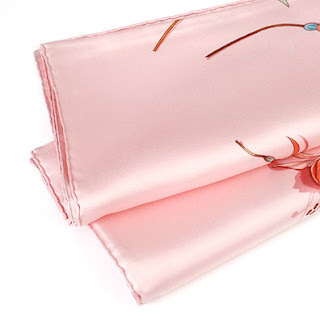 Although pink does not flatter every complexion, this is a great item for anyone appreciating and able to sport pastel colours. Of interest is the impact of the sparse design on the material, featuring the fabric itself in all its splendor (in my experience, the majority of the designs are so rich that the admirer is tempted to forget the actual "canvas" and focus exclusively on the picture, whereas with designs such as this one, the actual fabric takes center stage as well and adds to the impression of purity and voluptuousness). Another visual feast, dedicated to a very dear friend of mine who continues to believe in me and to encourage me and support me in all my endeavours. 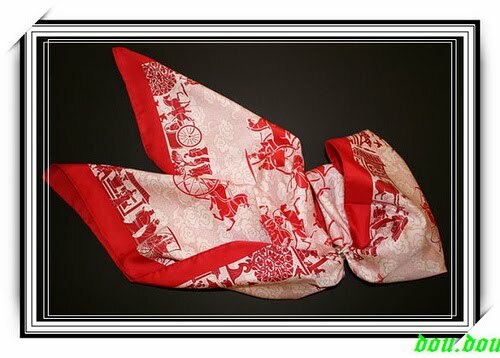 In this regard, this scarf is a celebration of accomplishments and of profound and meaningful human connections - including spiritual connections. She is the kind of friend whom I understand (and "get") and with whom I communicate without the use of words. 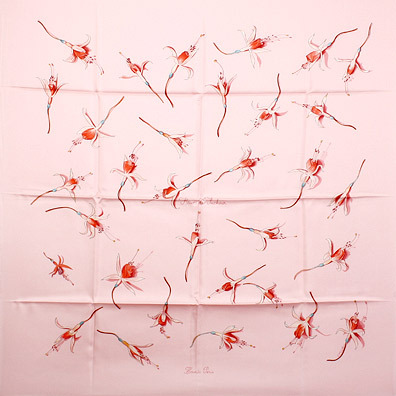 Last year I introduced the Belles du Mexique scarf, a design that I found beautiful, but also appropriately described as hypnotically captivating. Today I am featuring a reinterpretation of design, this time in a smaller size, because its effects on me are equally enchanting, stirring and inspiring - similar to the influences of great friendships. And since it is thanks to this very design that our paths crossed, I found it only appropriate that I dedicate this post to a new friend whom I had the privilege of meeting - albeit virtually, for now - and whose kind words, generosity and discriminate taste for beauty are both admirable and tremendously inspiring. Beyond her exquisite beauty and stylish appearance, this friend is, for me, the personification of absolute elegance - a trait that I attribute to her distinguished attitude, that inner (and an utmost intimate) element that defines us and imprints, in everything we do and everyone we meet, the signature of our being. Picking the scarf in the gavroche size (45cm x 45cm) was not random, but rather triply symbolic: first, while I had already been mesmerized by this design when it was first launched, in 2007, it was her initial purchase of this scarf that triggered my curiosity about it (she posted pictures of herself sporting it in various fun ways which further added to my admiration both for the scarf and for my friend); so in this respect, it is this very design that brought us together. Second, the smaller size is equally symbolic of our young, yet rich and meaningful friendship. Like any relationship, friendships blossom over time - sometimes in unexpected ways - and while the potential is plentiful, they require care as they are cultivated. But make no mistake! They are as fragile as the snowdrops (or "Indian pipes", although these are not as appealing as the former) so understanding, caring, rich nutrients and abundant warm light are of paramount importance to the growth of such friendships. Third, this design, with its twirling dancers, exude vitality, vivaciousness, love for life and optimism - traits that I recognized in my friend and which - I consider - define me as well. 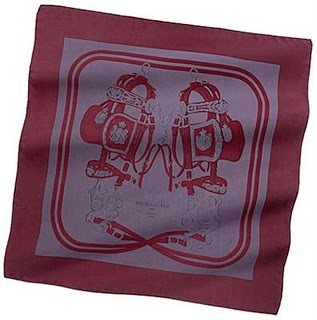 This scarf was issued in 2009, the year when my friend and I crossed paths, so this is yet another reason behind my choice. The magenta, brown and various hues of orange instill a richness in the design unmatched by any other colour combinations - just as a profound person, like my friend, would instill in our friendship. Finally, note the signature on the scarf - my friend's pen name and title of her own site, where even a brief visit will convince you of the truth of my words about her. She took this shot, so we can all admire the scarf in all its splendour. This is a scarf that I cherish not only for its pattern and colours, but also for the rich symbolism I attribute to it. 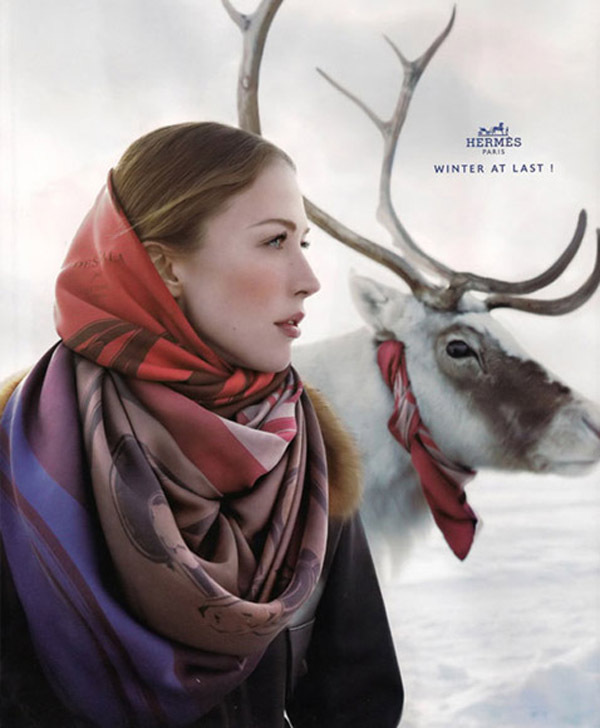 If I were to use a single word to describe - either the scarf, or my friend - that word would be exquisite ! Hermès has released another design for the Fall/Winter 2009 season from my favourite designer, Leigh P. Cooke, yet the scarves themselves, for the most part, have failed to captivate me. My first reaction was that of excitement at Cooke's creation, particularly in light of the organic theme (leaves and fruit), yet on closer inspection, it depicts a static moment, and the texture of the leaves, craftfully depicted otherwise, suggests mature branches in a state of abandonment, perhaps fallen and spread across the sidewalk due to the changing of seasons. It also carries my thought and imagination to nature past the moment it peaked, after the autumnal rich harvests and blossoms - hence a rather serious, collected stance mood. The creative aspect and ingenuity are definitely noted. The one colour (depicted) that stirrs me is the baby pink one. Perhaps other colours may give away a different impression once they're knotted ? I saw a taupe background variation, so I'm quite eager to check it out when it becomes available. Another treasured find, albeit not in my collection, is this very joyful scarf in summery colours. So youthful, so playful, and so dynamic ! Lots of fun ! 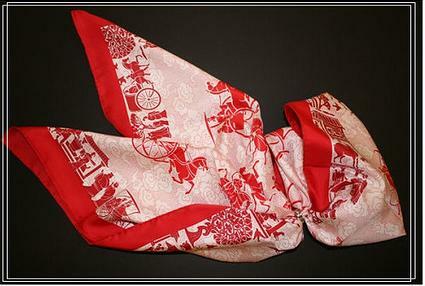 This scarf is a tribute to the revered Kelly bag - so named after the former American actress Grace Kelly who used one such bag to shield her pregnancy - with the future Princess Caroline - from the prying eyes of the paparazzi; although launched in the 1930's, it was this 1956 event, photographed and wildly publicized, that brought this timeless handbag into the light and granted the design its iconic status (Stephanie Henderson, in her book entitled "Handbags, What Every Woman Should Know" indicated that the newly married and shy Princess, when faced with a pack of noisy photographers and not yet willing to announce her pregnancy to the world, did what every woman would do - hide her secret in her handbag !). 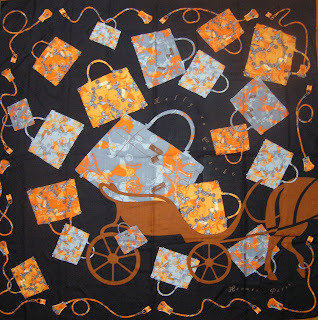 The design cleverly depicts three of the iconic elements that the Maison has been associated with throughout the years - all part of its creations: the carriage (or calash), reminiscent of the Maison's fonding years and having become emblematic of its roots and part of the Maison's logo, the Kelly handbag and the locks meant to seal one's objects inside the handbag. 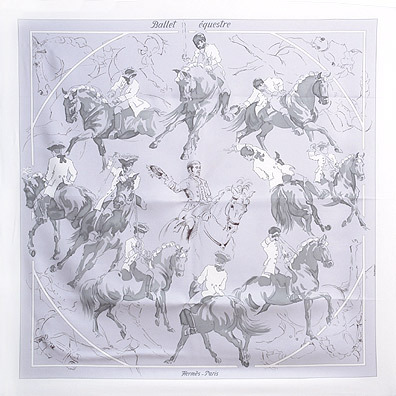 Issued in 2007 to celebrate the 70th anniversary of the Hermes carre, this design was released - symbolically - on a 70x70cm scarf. 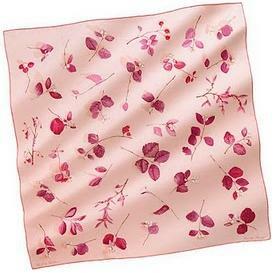 Its unimaginable popularity and success has been reflected in consequent reissues, as a twilly, cashmere and silk (depicted above) and, most recently (2010), in cotton. This pattern is superb, many admirers choosing to frame the scarf so as to admire its splendour with every passing by (see below). 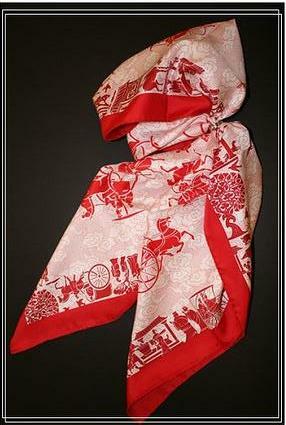 If you feel compelled to wear a piece of art, the scarf ties absolutely magnificently - pure magic !